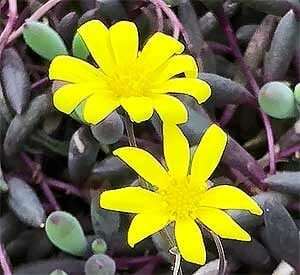 An excellent small succulent for hanging baskets, Othonna capensis ‘Ruby Necklace’ is fast growing and easy care. 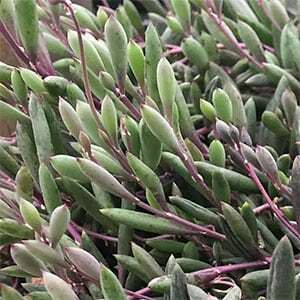 It has small elongated foliage on long trailing stems that are said to look a little like small beans, and to add to the appeal the stems are a purple colour. This is a plant that like to trail, it will only support itself to around 5cm in height, however it will trail down for around 50cm in ideal conditions. Small yellow daisy like flowers appear mainly in spring, however this oil plant that will flower almost year round. The foliage will vary a little in colour depending on the season, in cooler months it takes on a purple hue, in warmer months it is green. Best grown in a hanging basket where its trailing nature is on show, this is a plant that requires a well drained soil or potting mix. These are a summer dormant plant, and therefore less water in summer is best. Try a position where the plant will get good sun with perhaps a little shade on hot afternoons. As the weather cools a little, Othonna capensis ‘Ruby Necklace’ will spring into life and this is the time to fertilise and water. Spread – Will trail to 30 cm over time. Flowers – Small yellow flowers on purple stems. Foliage – Mid to deep green, bean shaped.